Pork and pineapple is just one of those combos that I love so much. I realized I have a few other recipes here on my blog that feature the same ingredients! It’s so delicious. Mix red wine vinegar, garlic and red pepper flakes in a bowl. While whisking, stream in oil, and whisk until emulsified. Add pork, coat evenly, and let marinate for 6 hours (or overnight). For the sweet and sour sauce, whisk ketchup, white vinegar, sugar, soy sauce, salt and sesame oil in a bowl until sugar is dissolved. Set aside. Drain pork (reserve marinade) and place on hot grill. Thread skewers with pineapple, peppers and onions and baste with a little marinade. Place on grill after pork has cooked for 10-15 minutes. Around 5 minutes before taking everything off the grill, baste pork and skewers with sweet and sour sauce. Cook pork for total of 25 minutes or so, and be sure not to overcook veggies. Let pork rest for 5 minutes before cutting. You definitely cannot tell that wasn’t cooked outside. Your grill pan must be awesome. 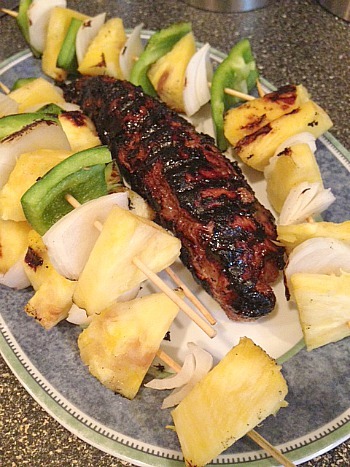 Love grilled pork and pineapple!